As a coach, I strongly believe that everyone should have access to coaching. Yet I know that this isn’t always easily available or affordable. 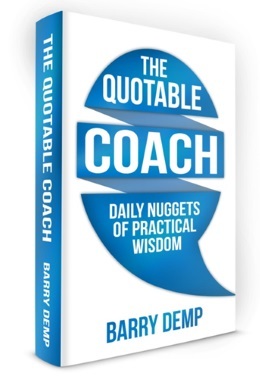 I wrote The Quotable Coach: Daily Nuggets of Practical Wisdom to make coaching accessible to everyone. This book is designed to be a simple way to grow each day. It’s not just a book of quotes, like others that you may have come across: with every single quote, I include a short reflection to help you dig deeper, plus a practical exercise to encourage you to turn inspiration into action. Print version: My CreateSpace eStore, or from Amazon if you prefer. I’m confident this will work for you: I’ve been running a daily series (Monday – Friday) of quotes for more than two years, reaching out to over a thousand people all around the world. You can buy The Quotable Coach: Daily Nuggets of Practical Wisdom as an ebook from Amazon.com or Amazon.co.uk and as a paperback book from my CreateSpace eStore. It costs just $4.99 as an ebook, or $18.99 as a paperback. I’m Barry Demp, a business and personal coach based in Troy, Michigan. I’ve been coaching for more than twenty years, and have worked with well over a thousand people, helping them grow in their professional and personal lives. For 15 years, I have held the distinction of Master Certified Coach from the International Coach Federation. Wendy and I have been married for 35 years and have raised two wonderful children, Dan and Rachel. Dig into five or six quotes every weekend. Read one quote every Monday – Friday with a small group of colleagues at work. Share and discuss a quote most evenings with your family or friends over dinner. Write out several quotes that are particularly meaningful to you. For maximum effect, please read the reflections and do the exercises. Remember, you can get the ebook from Amazon.com and the paperback from my CreateSpace eStore.